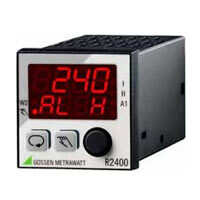 R2400 Compact Temperature Controller, 48 x 48 mm. Digital controls with analog operation: all parameters can be configured by simply turning a knob. Especially positive feedback is coming in from typical fields of application including machinery and device manufacturing. The single channel temperature controller with a high-performance PDPI algorithm and self-optimization offers a wide range of functions, even with the standard model. This reduces the number of product variants and warehouse costs, and simplifies service operations.